You might be planning your next family vacations and many people have told you how wonderful Xel-há is, however, you are still unsure how to make the most of it. If this is the case, Delphinus tells you what not to miss out once you are in Xel-há. Xel-há Park is considered to be one of the largest natural wonders in the world. Located in the Mexican Caribbean, you will undoubtedly spend idyllic family vacations here. Discover all its potential! These large natural sinkholes, known as “cenotes”, are invaded by unique vegetation that once served as the setting where Mayan priests carried out sacrifices and communicated with their Gods. Today, it is not possible to enter given the importance to protect the wells from any exterior alteration. However, they are an absolute delight to watch. This activity is a favorite because of the large variety of fish you can admire: angelfish, surgeonfish, sea robins, damselfish, parrotfish, snappers, rays or pufferfish. And that’s not all. You can snorkel for as long as you want in any of the 5 areas at Xel-há. For those of you who will be bringing along the kings of the household, there is a designated play area for kids where they can play with all kinds of games while, not far from there, you rest in one of the comfortable hammocks and relish your time at Xel-há. One of the aquatic activities on offer is swimming with dolphins in the Riviera Maya. There is a choice of 2 interesting and fun interactions: Interax and Primax. During both of these interactions, you will be up close with one of the ocean’s most intelligent marine species. 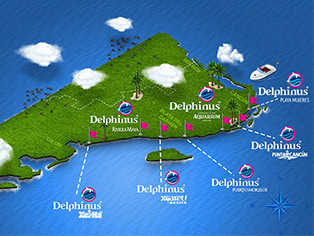 Delphinus hopes you can enjoy this experience during your next visit to the Mexican Caribbean. At Xel-há, the possibilities are unlimited: tours through the jungle and caves, jumping platforms, ropes to swing into the water and many more attractions. If you would like to know everything about the park, click here and find out how to make your next vacations into a unique experience. Make your swim with dolphins in Mexico the highlight of your trip, know more about these incredible marine mammals, their habitats and how fascinating it is to be in contact with them.